Crazy Frog Racer 2 (PC/ENG) : PC Game ~ My Media Centers-PC & Android Games & softwares,Movies, Tips And Tricks & Much more.. The Crazy Frog is cranking up the speed for his latest and greatest racing adventure! After winning the cup and escaping the Drone, the Crazy Frog is now ready to shift into the next gear for the craziest race ever! With more speed, zanier power-ups, new friends and even more insane tracks, there is no stopping the Crazy Frog this time! 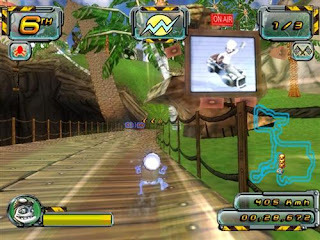 Race through the popular music videos of the Crazy Frog world and use even more zany power ups to ba-ding ding the competition. Race through the cityscape of Axel.F or head to the beaches of "Popcorn". 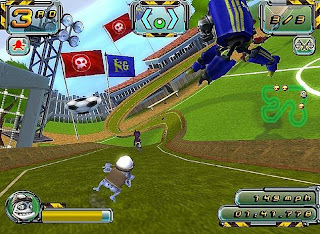 Crazy Frog Racer 2 is jam-packed full of new features that any Crazy Frog fan will find irresistible.